We present upper and lower bounds for extremal problems defined for arrangements of lines, circles, spheres, and alike. For example, we prove that the maximum number of edges boundingm cells in an arrangement ofn lines is Θ(m2/3n2/3 +n), and that it isO(m2/3n2/3β(n) +n) forn unit-circles, whereβ(n) (and laterβ(m, n)) is a function that depends on the inverse of Ackermann's function and grows extremely slowly. If we replace unit-circles by circles of arbitrary radii the upper bound goes up toO(m3/5n4/5β(n) +n). The same bounds (without theβ(n)-terms) hold for the maximum sum of degrees ofm vertices. In the case of vertex degrees in arrangements of lines and of unit-circles our bounds match previous results, but our proofs are considerably simpler than the previous ones. The maximum sum of degrees ofm vertices in an arrangement ofn spheres in three dimensions isO(m4/7n9/7β(m, n) +n2), in general, andO(m3/4n3/4β(m, n) +n) if no three spheres intersect in a common circle. The latter bound implies that the maximum number of unit-distances amongm points in three dimensions isO(m3/2β(m)) which improves the best previous upper bound on this problem. Applications of our results to other distance problems are also given. The research of the second author was supported by the National Science Foundation under Grant CCR-8714565. Work by the fourth author has been supported by Office of Naval Research Grant N00014-87-K-0129, by National Science Foundation Grant No. NSF-DCR-83-20085, by grants from the Digital Equipment Corporation and the IBM Corporation, and by a research grant from the NCRD, the Israeli National Council for Research and Development. 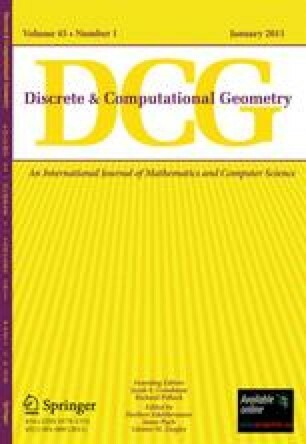 A preliminary version of this paper has appeared in theProceedings of the 29th IEEE Symposium on Foundations of Computer Science, 1988.